This is the age of components. Frameworks built for UI components, such as React, enable us to split our UI into individual, reusable pieces which can be developed and used in isolation. As such, React components can often be adjusted and reused in multiple projects and apps. Instead of duplicating them or reinventing the wheel, we can benefit from their modularity and reusability by sharing them between our projects. 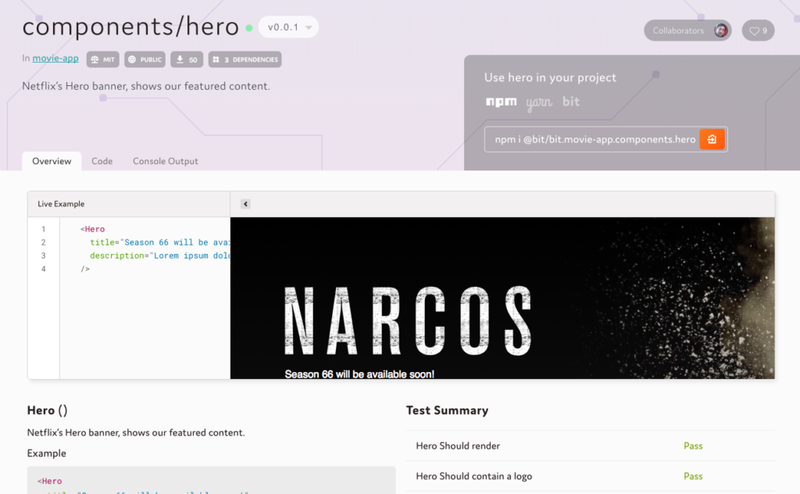 Bit is an open-source project that works with Git and npm to speed code sharing and lower the overhead of having to split your codebase and making changes to multiple packages. Instead, you can easily share parts of any existing repository, use them in other projects and easily sync changes between them. Let’s look at this React app. As you can see, it contains eight reusable components in the src/components directory. Some of them also use the global styles, which probably can also be used in other apps as well. Now, let’s say I want to use one of these components in a different app. Before Bit, my main option was to split this repo, create a new one, add all the configurations needed — including build and test environments — and publish a package. I would have to do that eight times, while also duplicating code between them. I would end up with nine repositories to maintain, and I would have to make changes between them. I could also use Lerna, but it would force me to refactor my project’s codebase into a monorepo, and even then I would still have to manually define and maintain the setup and dependency tree for all these packages in my app. On top of it, discoverability would also be poor for all of these packages making it harder to adopt. Facing this kind of overhead, most people are likely to end up copy-pasting code, which is very bad. Bit is the fastest way to share React components with nearly zero overhead. Instead of splitting your codebase into more repos, Bit lets you easily share components from any existing repository and use them in other repositories and projects with npm. The idea behind Bit is to decouple the representation of the code you share from your project’s file system. As a result, you can simply point Bit to the components you’d like to share and export them from your project — without actually changing its structure or source code. Once shared, your components will be available to install using your favorite package manager. Another advantage of Bit is that it can track actual source code found in multiple repositories, so that you can also use it to easily import the component’s code and change it from any other project — and let Bit sync changes for you. Any component can be individually shared, discovered and used in any application or project. It can also be modified and updated from any project environment, choosing if and how to let our friends update our components from their own projects (and vice versa). Shared components can be grouped together into “Scopes”, which are collections that can be thought of as “playlists” of individual components sharing common attributes. When using the free Bit community hub, each component is presented along with its rendered visuals, test results, semi-automatically generated docs and more. Here’s the Scope of components shared from the above React movie-app. You can take a look at this Hero component. Regardless of the tools we use to install our components, we can gain full control over our dependency graph and get a clear picture of the components used across our projects. Sharing code can also help keep our UI lined to our design principles, as we can easily control changes when implementing the same components again and again in different projects. Let’s share the UI components button, login and logo in the following project’s directory structure. Now let’s use Bit to track these components. Don’t forget to add build and test environments. bit add src/components/* # use a glob pattern to track multiple components or a single path to track a single component. Note that using the --eject flag you can remove an exported component from your source code and add it as a package dependency in your project’s package.json file. That’s it. You can now install components using npm and Yarn or use Bit to easily edit and update their code from any project. If you’re using a code component that requires modification, you can import your component using Bit, change it right in the context of your project, and share it back out. Using the eject flag you can even eject the component back to being a package dependency for your project. Note that Bit is able to track and sync changes to source code across different projects even if the code is actually sourced in these projects. You can think of it as “managed copy-pasting” without duplications, if you will. Bit is probably the fastest way to share React components with the least amount of overhead. Using Bit, you can avoid copy pasting code and make it easier to make changes and maintain your components while using them in different apps. Your entire team can organize all your components in a Scope, and create different versions to use in different places. New team members can easily discover these components and on board your work with the existing code you already wrote. Bit is an open-source project so feel free to get started, suggest feedback or help make it better!